Do you like hot cocoa? I do. While some people only drink cocoa, or tea, or coffee, or hot cider, I drink them all! I love to get cozy with a hot cup of something. So does my son. My son also loves snow days. He will often be out ALL day on any snow day. I’m sure you can imagine we use a lot of cocoa. So for a few years now, I’ve been making my own hot cocoa mix. It’s handy to have, cheap to make, and tastes great! It’s a blend of various recipes I’ve found in old books and magazines over the years. 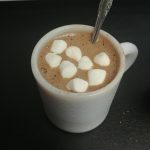 It so easy and in about 15 minutes or less, I have several cups of hot cocoa mix! I keep mine in a 3-quart container that is more than half full when I make a fresh batch. To make it extra easy I use a method that requires no detailed measuring. In my recent Fiskars Box Opening Video I quote that I don’t measure, and it is true. I am much more of a cut here, toss this in, use what feels right kind of girl (remember the troll cooking and troll crafting I’ve mentioned??) Well you just can’t do that with a good hot cocoa mix, so I found the best way to simplify it to the way I like to do things while also making a great cup of cocoa. It's a great base mix. After adding your mix to your cup you can jazz it up with vanilla, peppermint, candy canes, creamer, marshmallows, chocolate chips, whatever your heart desires. So easy- You'll be mixing 1 can of cocoa, 1 can of sugar, and 2 cans of dry milk. Simple dump your cocoa into a bowl or container, then use the same cocoa can to measure your sugar, and again to measure your dry milk! No measuring cups needed. When you're done simply toss the cocoa can in the recycling bin, OR make something awesome with it, your choice! Dump your ingredients in and either pulse in a blender, food processor, OR send through a flour sifter. IF You simply mix it in a bowl it will be hard to blend in when you are making a cup. You'll get watery cocoa with weird gloop at the bottom. You definitely want to blend it up somehow. Store in an airtight container. You will need about 2 Tablespoons of the mix for a standard coffee mug, or 3 for a larger travel mug. Just top with boiling water and stir well. If you'd like to make less mix use smaller ratios! Just remember 1 part each of cocoa and sugar and 2 parts of dry milk. Using 1/2 T of each of cocoa and sugar and 1 T of dry milk will make exactly one mug full. For a rich and creamy cup measure your mix into a mug, add just enough cream, milk, or half n half to make a thick mix. Then top with boiling water. It’s easy enough that my son can make a basic cup by himself. Usually, if I make a cup I jazz it up a bit. Which is exactly what I would do if I bought a mix as well. I like to mix in a bit of cream or milk and then add boiling water to make an extra rich cup of cocoa. Rich enough to handle a chocolate craving! It looks like this, and then I top off the cup with boiling water. The best part is that the whole giant canister of homemade mix cost less than $6 to make and has simple ingredients I can trust! I use a can of cocoa mix from Aldi for $1.89, I pay about $6 every few months for a box of dry milk which makes a batch of this and several other recipes as well, the recipe uses less than half of the box. The cost of sugar is less than a $1 for the ratio I use out of a bag. When I make a batch sometimes I toss all the ingredients into a mixing bowl and then pulse it in batches, and then shake up my container. This time I grabbed my blender jar and dumped it all in there, then used the pour spout to make it easy to put in my flour sifter. Looks pretty all layered up, doesn’t it?? You CAN also pulse it in a blender but if you do don’t fill it this full! I’d love to know, are you a cocoa drinker? OR do you prefer a different hot drink? Let me know in the comments! Previous Post: Fiskars Box Opening– I got a Goody Box!! Next Post: Listerine- And it’s Interesting 1930s ads. Sounds yummy! I’ve made a variety of DIY mixes over the years and some of them get quite complicated. Especially when my son started drinking it I started to focus on making a large batch that was simple but good and over the years this is what I got.